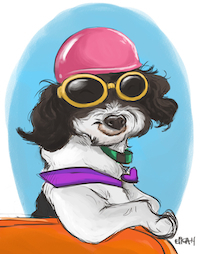 Petunia is a 7-year old Jackapoo (Jack Russell-poodle mix) who has traveled across the United States on the back of her human’s bicycle, two times– once on the TransAmerica route, and once on the Northern Tier. She has also accompanied her human on a bicycle tour of South Korea from Busan to Seoul. She currently resides in Montana, where she can be found scrambling along hiking trails, biking around town, and sometimes in her life jacket and floating down the Clark Fork river in an inflatable row boat. Q: How safe is she safe in that carrier? Doesn’t she jump out? A: Petunia is seat belted into her dog pod via a chest harness that has a harness low in the front, and another one on the back that prevents her from getting too far out when she’s enjoying the fresh air. She likes to ride and has not tried to jump out. Q: Where’d you get the helmet and glasses?! A: Doggles.com makes the goggles for dogs, and the helmet was purchased online from kooldawgtees.com. Q: What about when she has to go potty? A: She gives her human a specific poke in her back with her paws or nose when it’s time to get out, in addition to her usual grunt. Q: How’d you train her to stay in there? A: She started riding with me when she was a small puppy, and shes’s a mellow dog with a healthy sense of adventure. It doesn’t hurt that she’s kind of a mama’s girl, and I suspect she likes the attention she gets when people see us out on rides. We just met Greg, Jaimie and Petunia in Dubois Wyoming. What a family they are!! We invited them to stay with us in Oregon when they get to the Beaver State and hope to introduce Petunia to our various animals. Safe travels to these lovely adventurers, no sitting on the sidelines for these guys! Back in Bend now and remembering so fondly our meeting you all. We hope your travels bring you to Bend and we would be honored to have you stay as our guests for as long as you’d like. You are in our thoughts as you continue your fantastic adventure!